House Of Cards season 3 Blu Ray. 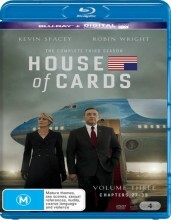 Stars Kevin Spacey as President Francis Underwood and Robin Wright as the first lady. In Season 3 of "House of Cards", President Underwood fights to secure his legacy. Claire wants more than being the first lady. The biggest threat they face is contending with each other. This thriller series stars Kevin Spacey as ruthless and cunning Francis Underwood, who will stop at nothing to conquer the halls of power in Washington D.C. His secret weapon: his gorgeous, ambitious and equally conniving wife Claire (Robin Wright). Click the button below to add the HOUSE OF CARDS - COMPLETE SEASON 3 (BLU RAY) to your wish list.